Do you feel like you’re not making the best use out of your skills, money and effort while at work? Perhaps you’re spending too much time on repetitive tasks like entering data into multiple systems or manually exchanging documents between members of your team. Fortunately, technology can help you get back control over your projects and do more with your day. Team management is one of the core foundations of any successful business or freelance endeavor. In fact, it’s safe to say that the ability to communicate clearly and transparently is one of the strongest leadership skills of all. However, without the right technology on your side, it will be much harder to build and maintain a healthy, teamwork-orientated environment. monday.com aims to change all that. A team management tool with a unique visual flair, it’s suitable for teams of any size from two freelancers working together to teams of thousands scattered across the globe. 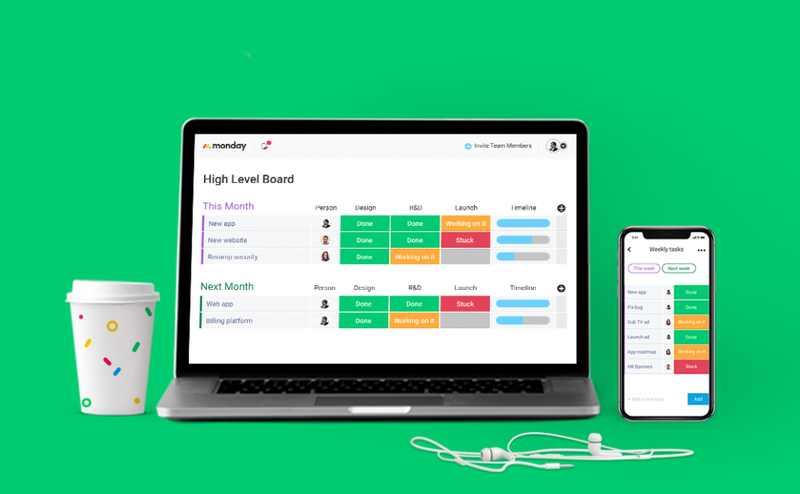 Whether you’re a freelance or you’re running a startup or a Fortune 500 company, monday.com aims to empower users through powerful cloud-based collaboration, integrated communication tools and centralized control over project management. The increasing ubiquity of the internet and mobile devices like smartphones and tablets have led to dramatic changes in the way people work. No longer restricted by the boundaries of the office desk, workers can now complete projects at home or get a head start on the day’s work during the commute. monday.com is built with the modern workforce in mind. That’s why it allows you to manage everything through a single, centralized system where project leaders can assign tasks to specific people and view project statuses in real time. It’s the ultimate to-do list, project overview and task-management solution all wrapped into one. No longer is there any need to get bogged down in spreadsheets, whiteboards and an ever-expanding mountain of sticky notes. With monday.com, it doesn’t matter where your team members are or what sort of devices they’re using. You’ll be able to keep them in the loop no matter what, thanks to the availability of apps for Android and iOS-powered smartphones and tablets. That means much less time spent sending emails, organizing meetings and scheduling phone calls. There’s no doubt about it â€“ technology is often complicated, and choosing the wrong software can make you less efficient than you were before. There’s also the fact that modern businesses generate a whole lot of data during their routine tasks, project management included. It’s the ability to make sense of all this data that lets you truly realize the maximum potential of your business. monday.com takes a visual approach to team management. With its intuitive design and striking visuals, you’ll never have to worry about missing an important deadline again. Furthermore, its built-in collaborative tools help you communicate with your team in context by adding extra rows to boards and sending automatic alerts in real time. There’s no training needed either â€“ the interface is immediately recognizable thanks to its self-explanatory controls and practically non-existent learning curve. For decades, spreadsheets were the gold standard in team or project management. After all, there’s a reason why Microsoft Excel remains one of the most popular tools in the workplace. But, did you know that almost 90% of corporate spreadsheets contain errors? That greatly increases a domino effect leading to serious problems with the project being managed. There’s also the fact that efficient team management relies on much more than just spreadsheets â€“ there’ll be other things too, like documents, videos, photos, illustrations and even printed content that needs to be scanned in. Now, imagine consolidating everything together under a single platform, reinforced by a unified search system that allows you to quickly browse through every project your team has ever worked on. With monday.com, your business portfolio becomes a full-fledged knowledgebase completes with searchable insights into past and current projects. By having such a system in place, you’ll be able to set your business up for continuous improvement, and that’s exactly how the modern, agile way to do things works! Are you ready to streamline your projects with a team management tool that you can depend on? Visit monday.com today to start simplifying the way your team works.